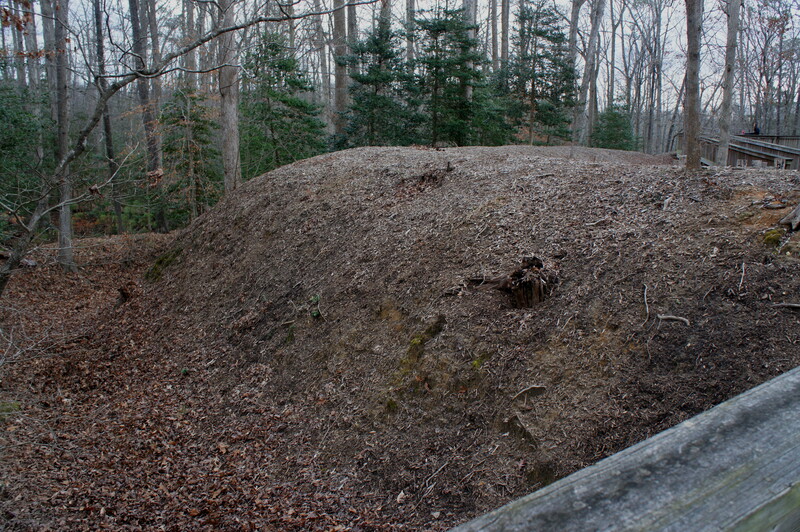 On the eve of battle in May 1862, Confederate Col. John Magruder’s “third line” of defenses on the Virginia Peninsula comprised 14 redoubts—small, enclosed defensive fortifications built from earth, sod, and timber. Together they served to temporarily delay the Union Army of the Potomac during the Peninsula Campaign (March-July 1862) in an engagement known as the Battle of Williamsburg. Aptly-named Redoubt Park in Williamsburg preserves two of the 14 redoubts in Magruder’s third line. Though neither saw fighting during the battle, they remain well-maintained, unlike many others in the area that have been lost to creeping suburban development. 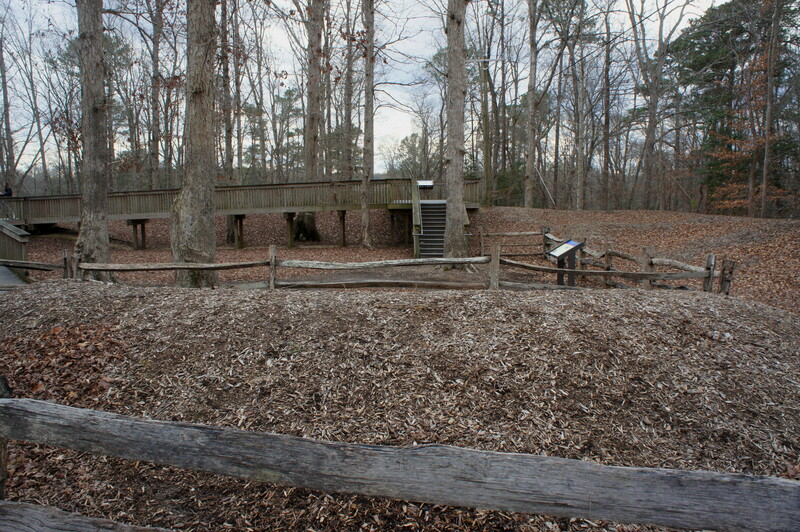 The walk to and around Redoubt 1 is paved and partly wheelchair-accessible; five waysides tell the story of Magruder’s line and the Federals’ partial victory in the Battle of Williamsburg. Redoubt Park is situated in southeast Williamsburg, a short drive down Quarterpath Road from bustling U.S. Route 60. Drive past Quarterparth Park, entering a wooded area. Then bear left into Redoubt Park’s only parking area. Two trails depart from here: the easy Redoubt 1 hike and the winding Tuttle Trail, which leads through the forest to Redoubt 2. Park off to the right for the Redoubt 1 Trail. Here a Civil War Trails sign provides a summary, in broad strokes, of Williamsburg during the war, long past its heyday in the colonial days that made the town famous. Bearing west on the paved path, the trail approaches Quarterpath Road and then winds south. 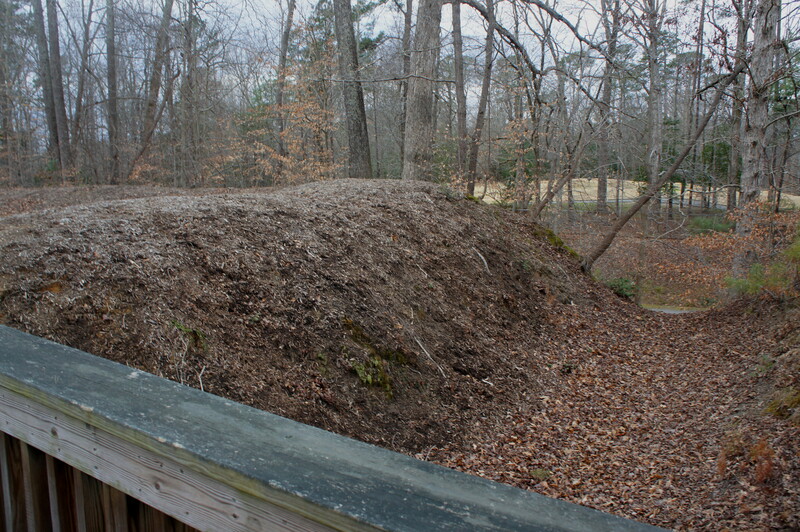 Though wooded today, in May 1862 this area was cleared and teeming with Confederate forces, a last bastion in Magruder’s three-tier defense of the peninsula. Situated 600-800 yards apart, the 14 redoubts of the third line had to wait longer than expected to see action: Union Gen. George McClellan, famed for what Abraham Lincoln dubbed the “slows,” inched his Army of the Potomac up the peninsula at seemingly a snail’s pace in the spring of 1862. Wary of Confederate defenses, McClellan took nearly a month to overtake Magruder’s second and strongest “Warwick-Yorktown” line in early May. As McClellan prepared a massive bombardment of Magruder’s second line, Confederate Gen. Joseph Johnston pulled his forces back to the Williamsburg Line on May 3. Two days later, advancing Union forces caught Johnston’s rearguard, and the first pitched battle of the Peninsula Campaign ensued. 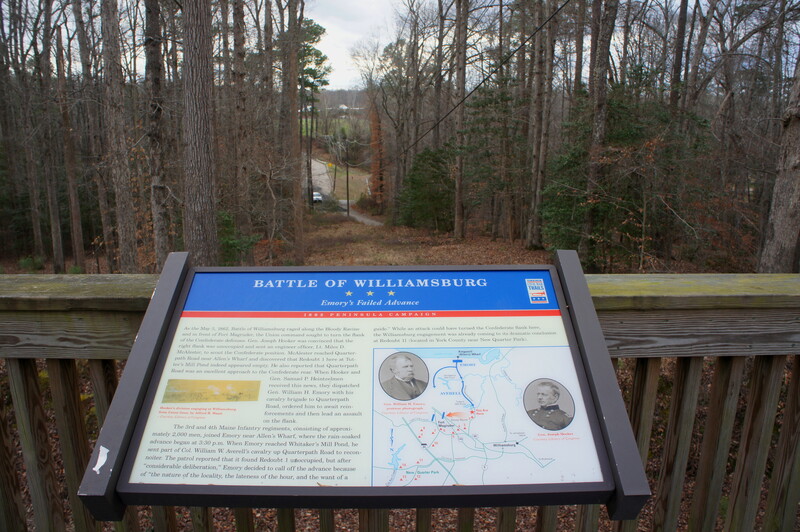 The Battle of Williamsburg took place farther east from where you are now, but the series of waysides along the trail today tell the story of the inconclusive fighting on May 5, 1862. 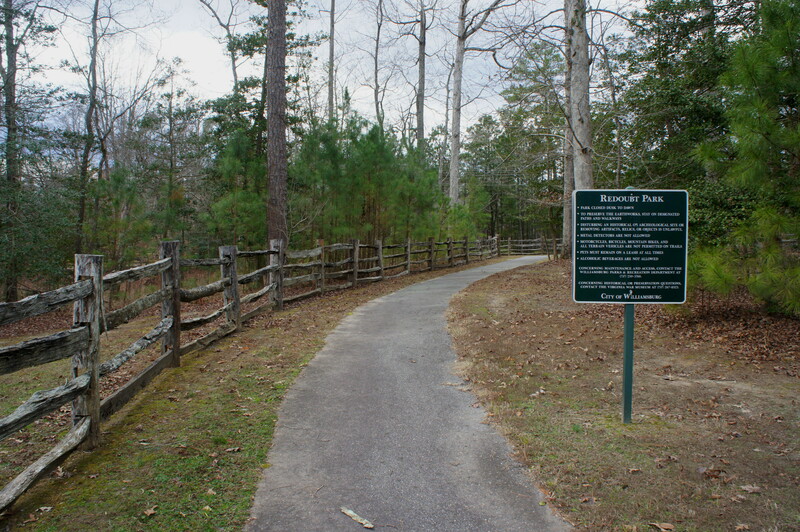 While Redoubt 1 was unoccupied on May 5, Quarterpath Road served as a vital artery for both Union scouts and Confederate Gen. J.E.B. Stuart and his famed cavalry. After 1/10 mile, the boardwalk trail clears the outer perimeter of the redoubt, revealing a short loop within. Heading down the steps to the right, the trail drops to surface level, then climbs a set of steps again to round the loop in a counter-clockwise direction. (Note: The waysides are arranged chronologically this way.) A south-facing wayside offers a view of Quarterpath Road and the approach of Union forces on May 5. By the time Federal troops arrived at Redoubt 1, the Battle of Williamsburg was already reaching its climax on the other side of the peninsula. Ultimately, the Union’s greater numbers forced Confederate troops to retreat farther up the peninsula toward Richmond. But the Battle of Williamsburg again persuaded McClellan to slow his advance on the Confederate capital, allowing the Southerners to regroup and prepare for the battles to come. After rounding the circuit, head back on the paved path to the parking area. Those looking for more can also check out Redoubt 2 on the Tuttle Trail, which starts across the parking lot to the east. This entry was posted in Civil War, Easy Hikes, Hampton Roads, Virginia and tagged Battle of Williamsburg, Civil War, historic, Peninsula Campaign, Quarterpath Road, redoubt, Redoubt 1, Redoubt Park, Virginia, Williamsburg. Bookmark the permalink.